Dutch fans in attendance in Rotterdam were treated by their two heroes — Raymond van Barneveld and Michael van Gerwen — going head to head in a match in which Barnveld delivered a surprising upset. It was billed as the match of night and it didn’t disappoint as the two finest players the Netherlands has ever produced served up a classic in which Barney fought off a late comeback attempt from the world’s best player, Michael van Gerwen, to win 7-5. Barney, at one point 6-3 ahead, looked to have let victory slip through his fingers as Mighty Mike fought back to almost draw level, before Barney landed a treble 20 followed by double four for the win. Oddly, this was van Gerwen’s second defeat in as many nights, made even weirder by the fact he was playing back in his homeland. This contrasted Barney, however, who was struggling for form prior to returning to The Netherlands but picked up maximum points over both days. Michael Smith returned to winning ways with a 7-1 destruction of Simon Whitlock. Smith lost badly on Wednesday to Gary Anderson, but went above the Scot in the table a night later after he sent early league leader Whitlock packing. It was The Wizard who took the first leg when Smith missed two important darts, but Bully Boy took over soon after and reeled off seven legs in succession. The defeat for Whitlock means the Aussie is propping up the rest at the bottom of the table while Smith stays fourth and on target for a playoff place in London a month from now. Two-time world champion Gary Anderson produced an imperious display against Daryl Gurney to win 7-3. Anderson, who one night earlier almost banked a nine-dart finish against Rob Cross, came close again on Thursday as he opened up with 177 and 180 before blowing it for the second night in a row. He didn’t blow the the match however, as he took out 88 to claim a 4-2 lead before hitting 13 and 11 dart legs, leaving one more for the win which came courtesy of a ruthlessly executed 92. Peter Wright’s weird form continued as he dug deep to earn a 6-6 draw with Rob Cross. Only 24 hours earlier, Snakebite had surprisingly seen off Michael van Gerwen but was often struggling to hang in there in Thursday’s match against the World Champ. Cross took the lead early on, throwing triple 140s, before landing an 81 to give him a 12-dart opener. Voltage followed this by breaking Wright’s throw in leg two after fans were treated to the familiar site of Peter repeatedly missing important darts at double, in this case four. Before long, Cross was up 5-2, but Snakebite was determined to make a fight of it, winning the next three to draw level. Having fought back, Cross began to wobble, missing six darts at the double but somehow pulled ahead 6-5 ahead before Wright came back to claim a share of the points. Daryl Gurney returned to the oche for the last of the night’s action needing to put his earlier defeat to Gary Anderson behind him. He did so in emphatic fashion as he beat Simon Whitlock 7-1, the Aussie’s second such reverse of the night. Gurney averaged just south of 100 and scored three maximums on his way to a comfortable victory. Matchnight 14 takes place this Thursday at the Manchester Arena with all the action broadcast live on numerous Sky Sports channels from 1900 GMT. Michael Smith has the opportunity to effectively eliminate many by closing off the top four this week should he pick up two points from his two matches. The first of these is the night’s opening game against Peter Wright, although increasingly erratic, should be in confident mood having taken three points off MVG and Rob Cross in Rotterdam. Michael had a tight grip on first but has now slipped down to fourth, but he remains three points ahead of Snakebite with a game in hand. Smith to win and shut out the others? Why not. Bet of the match: Smith to hit the most 180s, no 100+ checkout in the match and both players to average under 100 for 5/1. Next up is Daryl Gurney and Michael van Gerwen in a match that looks unlikely to throw up any surprises. MVG is the other player playing twice this week and although pegged back slightly last week, two wins on the night would provide him with a cushion at the top of the table as we start to look forward to the play offs in London. Superchin stands a slight chance of making the top four himself, but I expect Mighty Mike to extinguish that here. Add to Michael’s value by jumping on van Gerwen to win by over 2.5 legs, hit a 120+ checkout and over 7.5 total 180s for 11/2 at Betway. Simon Whitlock, who has an even more remote chance of progression than Gurney, is out next for his match against Gary Anderson, a near certainty for the O2. Like the previous match, this matchup looks unlikely to shock anyone — the Flying Scotsman all the way. For 11/4, I think it’s worth backing Anderson to win by over 2.5 legs, hit the most 180s and a 100+ checkout. Barney enjoyed his time back in Holland last week, picking up maximum rewards for seeing off Simon Whitlock and Michael van Gerwen. He goes again here against Rob Cross, who also handled the Dutch experience well, taking three points from three games. Like Gary Anderson, Voltage is still in the running to get that number one spot, sitting just a point behind MVG. Raymond’s form last week looked more like a flash in the pan and proved he still had the class of old. Back in the UK, I think the young blood of the World Champion will win out. I’ll go with Cross to win, hit the most 180s and hit a 100+ checkout for 4/1. The two Michaels finish off the night’s action, and assuming both win earlier on in the night, both will be in buoyant mood for the night’s finale. That said, MVG will be looking to bank his place on top of the pack and should dominate Smith, who is deserving of a place in the play-offs even if he loses out here. Betway continues to make things interesting by offering van Gerwen to win by over 3.5 legs, average over 100 and under 7.5 total 180s at 9/4. The line on Smith, MVG, Anderson, Cross and MVG pays at a rate of 11.15/1, while Betway have also boosted the following treble to 5/1; Wright, Anderson and Cross to win. The second of Rotterdam’s doubleheaders takes place on Thursday: same darts time, same darts channel. But first, we have a quick recap of last night where Gary Anderson produced an excellent performance that saw him beat Michael Smith 7-2 in the night’s opener. The Flying Scotsman posted an average of 109.92, hit four 180s and nailed seven doubles from 10 attempts to help him finish the night in third place, which he achieved after defeating Rob Cross in his second match of the night and the last of the evening. Anderson beat Cross by 7 legs to 3 but Voltage ended the night in second place due to his earlier win over Daryl Gurney. Winning by 7-4, Cross moves above Michael Smith in the table and has now won eight out of his last nine. Raymond van Barneveld gave the 10,000-strong Rotterdam crowd what they wanted after he posted a 7-3 win over Simon Whitlock. Averaging 100.96 with four 180s, Barney was back to his brilliant best in his homeland. Oh, and Peter Wright beat Michael van Gerwen. Yeah, sorry about that, did not see that one coming. That said, it was pleasing to see Snakebite playing well at long last as he won out the 7-5 winner in front of a partisan Rotterdam crowd, even if he does stay rooted to the bottom of the league. Even in defeat MVG looked good, landing a late double double but it wasn’t enough to prevent his four-point lead at the top being cut back to two. Mighty Mike will have the chance to bounce back in front of the Rotterdam fans when he takes on Raymond van Barneveld in Thursday’s fourth match. 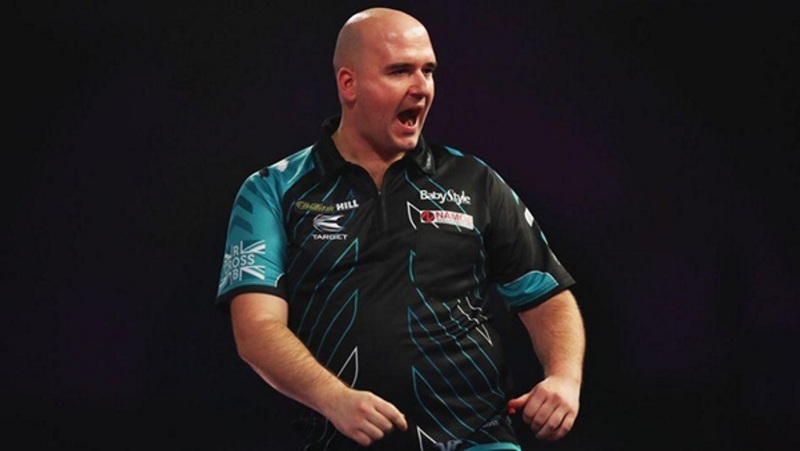 After last night’s shock defeat to Peter Wright, MVG will surely be stinging and would be expected to post a victory in this all Dutch thriller. The night opens with Simon Whitlock taking on Michael Smith. I’m siding with Smith to come out on top and give his chase for a top four spot a boost. After all he has done this season, it would be a tragedy if he missed out now. Gary Anderson is now going great guns, and I would expect him to see off Daryl Gurney, who also faces Whitlock in the last match of the night. It’s a close match-up but also one I see Superchin taking so I’m picking the Northern Irishman to come out on top. But I’m less sure of Rob Cross versus Peter Wright in the third. Everything is telling me that Cross, now back to his best, is the sure-fire winner here. But Wright is nothing if not predictable and after beating MVG for the second time this season 24-hours earlier, might be about to make a late charge up the table. Your call. For the record, I’m picking Cross though. Rob Cross and Michael Smith served up a classic for the Yorkshire masses at the The FlyDSA Arena in Sheffield last Thursday when Voltage shocked The Bully Boy. Putting a dent in Smith’s excellent Premier League form was reigning world champion Rob Cross who emerged a 7-5 victor. It was a match that swung back and forth throughout as Cross took the first leg despite Smith opening up with five superb hits. Before long, it was 2-0 Cross after Smith missed a dart for 102, but his form soon picked up, as he put together a winning of streak of three legs in a row to take the lead. Not to be outdone, Cross went on his own winning run, taking repeated legs in 13, 12, 13 and 12 darts to reclaim a 6-3 lead. Smith won the next two legs before missing a vital 170 finish that left Cross throwing for victory, which he made in two darts, closing for 48. Raymond van Barneveld’s slump shows no signs of coming to an end after he won 7-3 to Daryl Gurney in the night’s opener. Barney came into the night off the back of defeats to Michael van Gerwen and Smith, and was on the back foot immediately after Superchin started with a break of throw. RVB did pick up briefly in the second leg, as he landed a 158 finish to level things before he then moved ahead. But Gurney took legs five and six to establish a 4-2 lead, before striking a 180 — his fourth of the night — in leg seven which he closed out with a bullseye. From there, Gurney was never likely to lose, despite Barney holding throw in the ninth leg. Things were over a set later when the Northern Irishman wrapped up the match with a 13-darter. In the night’s battle of the Scots, Gary Anderson landed four maximums as he swept aside Peter ‘Snakebite’ Wright in a 7-2 win. It was all too easy for the Flying Scotsman, who took the first leg without challenge, then broke Wright in leg 2 before effortlessly adding a third. Wright improved in the fourth, maneuvering himself into a position where he at least had the opportunity to have two shots at double. Typically for Wright of late, he missed both opportunities leaving Anderson to go 4-0 clear. The lead was soon extended to 5-0 as Snakebite, seemingly aiming for the all-time set advantage against record, missed bull for a 161 finish. Anderson passed up the opportunity to whitewash his opponent as he missed his own three shots on double, letting Snakebite back in to finally win a leg. Anderson held throw in the next as he homed in on victory, which came two legs later courtesy of a 13-dart leg. This was followed by another one-sided affair as Michael van Gerwen delivered a 7-1 mauling to Simon Whitlock. For MVG this represented eight Premier League wins on the spin and came after he lost the first leg but won the next seven to move four points clear at the top of the table. Whitlock won the first leg with a double 16, but that was as good as it got for the Aussie as Mighty Mike then took the second leg in just 13 darts. He took the lead minutes later with a 106 checkout, which was stretched further thanks to a maximum in leg four and another win in the fifth leg. Twelve darts was all it took for van Gerwen to wrap up leg six before closing out the match with an average of 102.37. 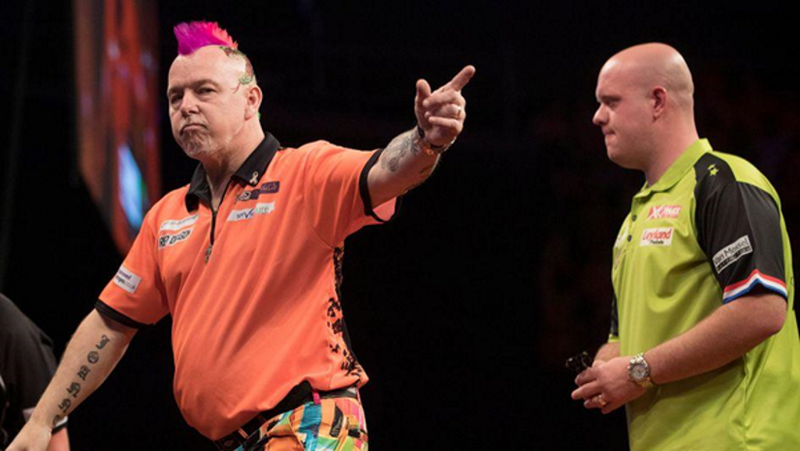 Peter Wright finally banked a win — his first in weeks — in his second game of the evening. This time the victory came against Raymond van Barneveld, who was also returning to the oche. The game ended 7-2 to Snakebite, who now moves level on points with Barney. RVG 21 darts to claim the first leg, which gives an indication of quality on offer from these two otherwise normally solid pros. Wright then took legs 2 to 4, hitting two bullseyes and a double 16 for a 132 finish in the last. Barney pulled one back in the fifth leg, before Wright took out 60, 107 and 43 to win the match and some Premier League respectability at long last. This week, we have a bonus night that was squeezed into the schedule to make up for the lost fixtures of the Exeter event, cancelled when a freak snow storm hit the UK over a month ago. Instead, we now head overseas to The Netherlands for Matchday 12 which takes place in the Ahoy Arena in Rotterdam. As usual, Sky Sports will be broadcasting all the action from 19:00 GMT. The first game of the night features Michael Smith and Gary Anderson with both players showing more than enough to make London’s final four. Smith has been absolutely brilliant so far, while Anderson has been efficient and difficult to beat, gradually raising his form up to where we expect it to be. As such, I think that given Smith’s tough defeat to Rob Cross a week ago and Anderson’s temperament and experience — not to mention his bigger need for points — we will see the two-time Premier League champion from the Scotland take the points here. At Betway, Anderson to win and hit a 100+ checkout with Smith averaging under 100 is worth 4/1 for those that might fancy it. Next up is Rob Cross versus Daryl Gurney, and while I’m siding with Cross on this one, it’s worth remembering the last time Superchin was the winner in what proved to be an excellent game in Belfast. In truth, there is little to split these two but Gurney, who last week announced the birth of his son, might just be the more worn out of the two. If you fancy Voltage like I do, what about this 5/1 special at Betway; Cross to win, Gurney to hit a 100+ checkout and over 8.5 total 180s. Raymond van Barneveld and Simon Whitlock are the night’s next pair to play, with both losing last week — twice in Barney’s case. The form book would have you backing The Wizard in this one, but back on Dutch soil, I’m going with van Barneveld to turn his form around. Try Van Barneveld to win, hit under 5.5 total 180s and both players to average under 100 which at Betway is priced at 100/30. Which brings us to MVG, who also returns to his homeland and in peak form. Pity poor Peter Wright, who having finally won a game last week, looks like a lamb to the slaughter here. In the past there would be no doubt that Snakebite could be in with a chance of taking the match — or at least run it close — but something is up with him right now and MVG back in the lowlands is simply not what he needs at this moment. For extra value on Mighty Mike, jump on him to win by over 2.5 legs, average over 100 and over 1.5 100+ checkouts in the match for the cool price of 9/4. The closing match of the evening sees Rob Cross take on Gary Anderson, whose unbeaten run in the Premier League now stands at six matches and he’ll hope to extend that here against Rob Cross. Of course, this is providing he wins his first match of the night, which we think he will. The last time they played each other Cross was the winner, the first time he had beaten Anderson and one that felt right at the time. However, with both playing their second match of the night, I think form favours The Flying Scotsman. Our five-fold for this week is Anderson, Cross, RVB, MVG and Anderson which pays at 25.39/1. Or try the Betway boosted price of 11/2 on this treble; MVG, Barney and Cross to beat Gurney, up from 9/2.